India’s state-owned Bank of Baroda — one of the country’s largest — played a crucial role in the financial machinations of South Africa’s politically influential Gupta family, allowing them to move hundreds of millions of dollars originating in alleged dirty deals into offshore accounts, an investigation by the Organized Crime and Corruption Project (OCCRP) and The Hindu has found. The Gupta brothers — Atul, Ajay, and Rajesh, who immigrated to the country from India in the 1990s — are accused of using their money and influence to pursue a project of “state capture,” in collaboration with former President Jacob Zuma, to enrich themselves at the expense of taxpayers. In some cases, the significant benefit to the Guptas and their allies was clear. The Baroda account of Atul Gupta, for instance, shows that he received 57.3 million rand ($4.8 million) from Westdawn, one of the shell companies, in a single transaction on March 26, 2015 (while reporting taxable income of just 1 million rand ($80,000) two years prior). Some of the money enriched former President Zuma’s son Duduzane, who held shares in a number of the companies that received large transfers. And the Gupta-controlled Westdawn provided Gloria Ngema Zuma, one of the former president’s wives, with a 160,000 rand ($12,300) monthly salary for a position she held at one of their firms. But many of the transactions were more complicated. Their purpose may have been to disguise the origin of money as it entered the Gupta empire — much of it obtained through friendly state companies and cozy contracts — and to blend it together to the point that it could no longer be tracked. At least some of the funds that flowed through the bank ended up in accounts controlled by the Guptas as far away as the United Kingdom, Hong Kong, and even the United States. Many of the transactions lacked adequate documentation about the purpose of the transfers, as is required in South African banking regulations. Other times, information was included, but didn’t make sense. For example, on June 14, 2016, the Gupta-controlled Koornfontein Mine wired 100 million rand ($6.5 million) to a Gupta-controlled mining company called Tegeta for “[environmental] rehabilitation,” meaning the repair of damage caused by mining activity. But Tegeta does not itself offer such services, which are typically handled by outside contractors, raising the question of the real purpose behind this transaction. Transactions flagged as “intercompany loans” involving companies owned or controlled by the Guptas. Infographic: OCCRP. 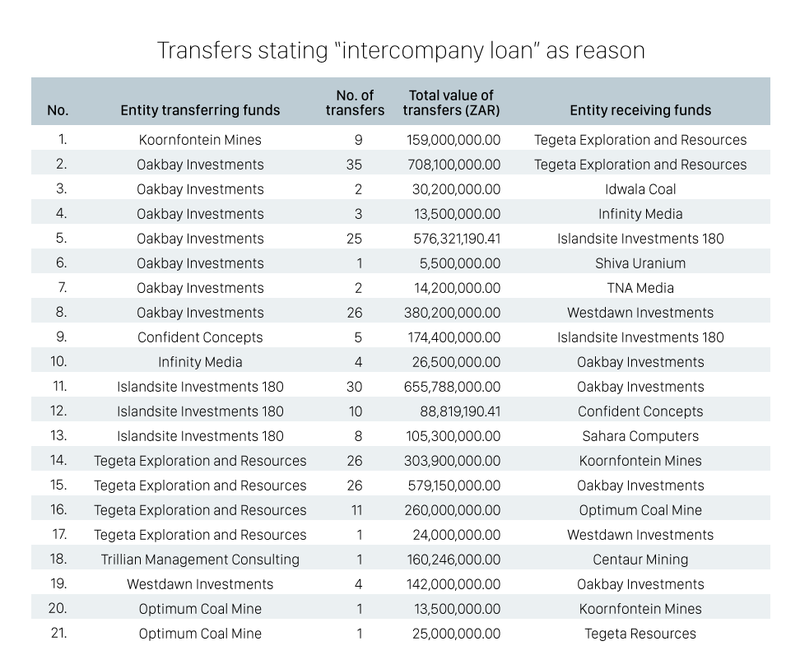 One particular technique shows up frequently in the transactions: Inter-company loans with no “apparent legal or commercial purpose.” For instance, on Jan. 18, 2017, transactional paperwork shows that Trillian Management Consulting, at the time majority-owned by Gupta associate Salim Essa, loaned 160 million rand ($11.8 million) from its Baroda account to another Gupta company, Centaur Mining. The actual loaned funds passed through another similarly titled company, Trillian Financial Advisory. However, while the transactions describe a loan, no loan documentation could be found and there was no explanation for why the funds for the loan were provided by another company. For example, Nedbank could perform due diligence on the foreign bank branch itself — but did not have access to money moved between Baroda accounts. It was up to Baroda to check these clients and oversee those transactions. On the other hand, there was other information Baroda could not see, such as the origin of transactions made to Baroda accounts from external banks. Partly as a result, neither bank took responsibility for ensuring that the transactions were legitimate. Eskom was like a bankomat machine for the Guptas — and there is evidence of high-level political involvement. Eskom executives like Anoj Singh and Brian Molefe had been handpicked by senior Gupta allies, like Public Enterprises Minister Lynn Brown, who themselves had been appointed by the president. Then, in December 2015, Tegeta announced that it would buy Optimum Coal for 2.1 billion rand ($160 million). South Africa’s Mines Minister — a known Gupta ally named Mosebenzi Zwane (who had been appointed by President Zuma) — travelled to Switzerland to meet with Glencore and the Guptas. Shortly afterwards, the penalty was waived. South Africa’s President Jacob Zuma announces his resignation at the Union Buildings in Pretoria, South Africa, February 14, 2018. Photo: Reuters/Siphiwe Sibeko. Essentially, Tegeta had paid for much of Optimum Coal using taxpayer money from Eskom — which had waived a fee that, according to the mine’s previous owner, had rendered the venture unprofitable. If the deal in fact went ahead as described, the Guptas would have effectively paid the $225 million for Tegeta to a foreign proxy — placing the money in Switzerland, a foreign tax haven, where it is beyond the reach of South African law enforcement. The loan was allegedly approved by Minister of Mines Mosebenzi Zwane, yet another Zuma appointee . It took until November 2016 for the Bank of Baroda to void the loan. It is not known what the Guptas used the money for. Days after former President Zuma resigned, Optimum Coal filed for a business rescue – a term describing a financially distressed company that is seeking external support to survive. Seven other Gupta-related businesses did too.